outstanding on spaghetti and meatballs! to make this sauce with mostly your own garden bounty! This pasta sauce is called "arrabbiata" because that's the word for "angry" in Italian! It's called that because it tastes so hot, it's as if it is angry! It's the chile peppers in this recipe that makes this sauce so spicy. Serrano peppers look like bright red green beans, but boy, do they pack a punch. 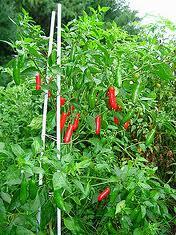 They are a very hot chile pepper. So for this recipe, make sure to have some rubber gloves on hand to wear when you are chopping them. Otherwise, the chiles might make your hands hurt if they come in contact with them. This recipe will make six pint-sized jars of sauce. Usually, there are about four or five servings per pint. So you can either can the extra, freeze it (leave about an inch of extra "head space" in the jar because it'll expand), or share it right away. It'll keep in the refrigerator for about two weeks. To start, bring a large pot of water to a boil. Break off the green stem of each tomato. With a paring knife, cut out and throw away the cone-shaped core of each tomato. When the water boils, carefully drop the tomatoes into the water and let them boil for a minute. Then remove them with a slotted spoon or strainer, and plunge into a big bowl of ice-cold water in the sink. Why are you doing this? To get the tomato skins to come off easily! This is called "blanching." If you don't remove the tomato skins, they will roll up into chewy little logs in your pasta sauce and you won't be happy. So, once the tomatoes in the ice water are cool enough for you to handle, simply strip off the skins and throw them into your compost pile or wastebasket. Chop them up on a cutting board into about 8 pieces per tomato and put in a strainer to let the extra juice run out. Set them aside for now. Take a large stockpot, and put the olive oil in it on medium-high heat. Add the onions and saute (cook, stirring frequently, until the onions are soft and fragrant, but not brown. This takes about 5 minutes. Now add the minced serrano chiles and the garlic. Saute another couple of minutes. Add the tomato paste, and stir for one full minute. Add all the tomatoes you prepared, along with the sugar, salt and pepper. Stir well. Bring to a boil over medium-high, stirring occasionally so it doesn't stick. Once it boils, reduce the heat to low, stir a few times, and let it simmer, covered, for 30-45 minutes. Because this sauce is so spicy, you might want to let each person spoon on as much or as little as they want on their spaghetti and meatballs, or other pasta.